The Federal Bureau of Investigation was an agency devoted to American ideals, professionalism, and scientific methods, directed by a sage and selfless leader—and anyone who said otherwise was a no-good subversive, bent on discrediting the American way of life. That was the official story, and how J. Edgar Hoover made it stick—running roughshod over those same American ideals—is the story this book tells in full for the first time. From Hoover's first tentative media contacts in the 1930s to the Bureau's eponymous television series in the 1960s and 1970s, FBI officials labored mightily to control the Bureau's image—efforts that put them not-so-squarely at the forefront of the emerging field of public relations. 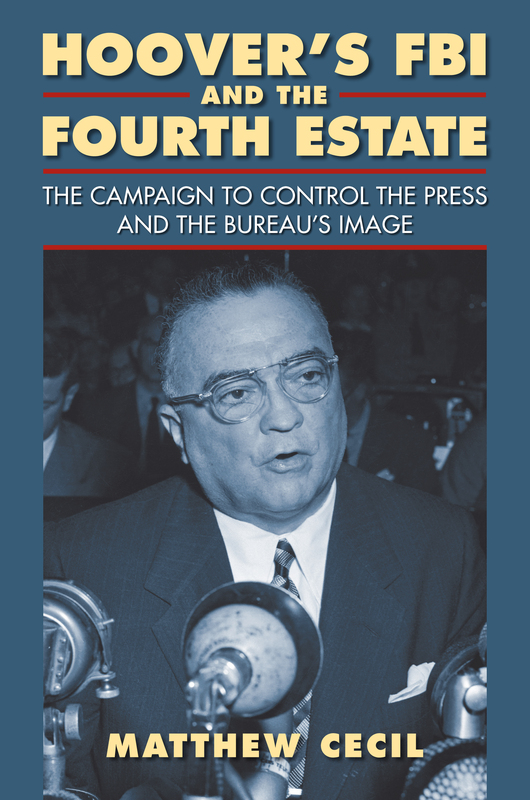 In the face of any journalistic challenges to the FBI's legitimacy and operations, Hoover was able to create a benign, even heroic counter narrative, thanks in part to his friends in newsrooms. Matthew Cecil's own prodigious investigation through hundreds of thousands of pages from FBI files reveals the lengths to which Hoover and his lackeys went to use the press to hoodwink the American people. Even more sobering is how much help he got from so many in the press. Conservative journalists like broadcaster Fulton Lewis, Jr. and columnist George Sokolsky positioned themselves as "objective" defenders of Hoover's FBI and were rewarded with access, friendship, and other favors. Some of Hoover's friends even became adjunct-FBI agents, designated as Special Service Contacts who discreetly gathered information for the Bureau. "Enemies," on the other hand, were closely monitored and subjected to operations that disrupted their work or even undermined and ended their careers. Noted journalists like I. F. Stone, George Seldes, James A. Wechsler, and many others found themselves the subjects of FBI investigations and, occasionally, named on the Bureau's "custodial detention index," targeted for arrest in the case of a national emergency. With experience as a political reporter, a press secretary, and a scholar and professor of journalism and public relations, Matthew Cecil is uniquely qualified to conduct us through the maze of political intrigue and influence peddling that mark—and often mask—the history of the FBI. His work serves as a cautionary tale about how manipulative government agents and compliant journalists can undermine the very institutions and ideals they are tasked with protecting. Matthew Cecil is Dean of the College of Arts and Humanities, Minnesota State University, Mankato.